According to The Center for Biological Diversity, Americans use 100 BILLION plastic bags per year, the average American taking home 1500 each. We use them for an average of 12 minutes, grabbing them from the roll at the supermarket, loading up our apples, oranges and bulk bin food, then dumping everything in the fridge when we get home and tossing the bags immediately. SAD. Even more sad is that only 1% of them are recycled. Annually, 100,000 marine animals are killed by these plastic bags and it takes 500+ years for one to degrade in a landfill. Fortunately, you have options to set yourself apart from this nasty habit that has become such an ingrained part of shopping behavior. 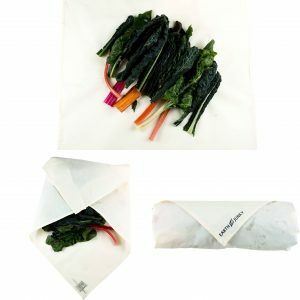 REUSABLE PRODUCE BAGS. 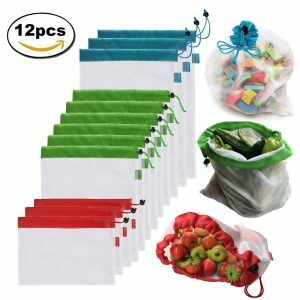 Yes, smaller bags that you bring to the store, along with your tote bags, that will serve to carry all your produce and bulk bin food and designed to be washed and re-used over and over, eliminating the need for you to grab even one (impossible to open) plastic bag off the roll. 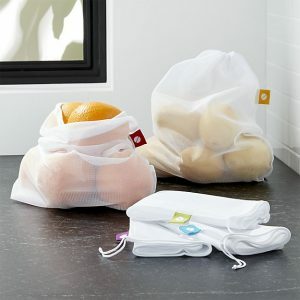 Where can I buy Earth Junky Organic Cotton Reusable Product Bags? The last item in the set is a swaddle sheet that is totally unique to the Earth Junky brand. I would describe it as a giant napkin to loosely swaddle your leafy greens in. 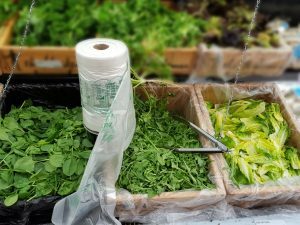 Not only does it keep your greens away from chemical-leaching plastics, but it also keeps them crisper and fresher for longer. Also, the Earth Junky Bags have the tare weight so clearly listed in three ways on a large tag outside the bag. At Whole Foods, they can easily deduct the weight of the bag if you have it in fractions of a lb. But some farmer’s market vendors like to have it in ounces, while some stores want it in grams, especially if you are out of the U.S. These bags covered the tare weight across the board. They are 100% organic cotton, they came in delivered in a reusable organic cotton dustcover (which was kind of like getting an extra bag for free) and they have a drawstring with a toggle that holds the bags closed tight. Earth Junky also boasts that they manufacture every bag with an extra inch on every side. Makes sense, since organic cotton will shrink and they are prepared for that. Overall, this set offered a great product with lots of value. The leader by a long shot. Not to mention, they have a very cool instagram account with lots of gorgeous photos that their customers, who they lovingly refer to as “Earth Junkies” like to share photos of their shopping excursions. This is a company worth checking out and supporting. The Crate And Barrel bag set is straightforward and practical and that’s why we like it. You get 5 bags, all the same size (12″ x 14″). These bags are sturdy and reliable and you don’t have to think about which one to choose because they are all the same. There is no tare-weight listed on the tag but for the low price of 11.95, you can’t really complain about any missing bells and whistles. We also like the colored labels which work for color-coding your produce, if you are into that sort of thing. The PurifyYou brand, well-liked on Amazon, brought us mixed feelings. There is a lot to like, the quality, the price, the functionality. 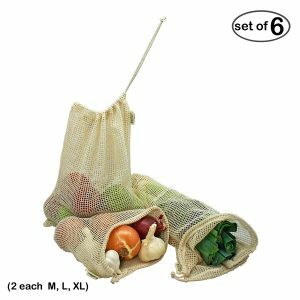 For example, you can actually wash your produce in these bags. They are made of synthetic polyester, so they will drip dry and go from the sink to the fridge easily. For the price, $18.96, you get an assortment of 18 bags, which is a great value. The downsides: The tare weight is only in ounces, the bags are all mesh so won’t work for bin food, and the biggest elephant in the room: They are made of polyester, a non-biodegradable material. We do appreciate the quality and workmanship of these bags, as well as the fact that they are still way better than using disposable plastic. But when given the choice between organic cotton and polyester to store your produce, this is a no-brainer. Another cool thing about PurifyYou is that they donate a portion of their profits to a new water-well construction in Kenya. Overall, a good product at a very good price. But if true sustainability and organic materials is important to you, then maybe not the best choice. Nevertheless, we appreciated the quality and quantity of this set. We also liked the color-coded sizes for easy to select bags. With the Brotrade set, you get 12 pieces for $14.97 which is just over a buck a piece. Not bad for a bag that you can wash an reuse over and over. 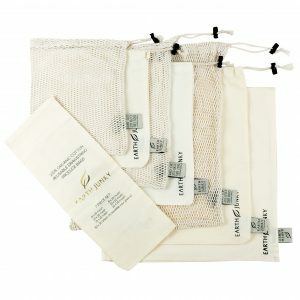 The downsides are pretty much the same ones as PurifyYou: tare weight is only in ounces, the bags are made of non-biodegradable polyester, which again, is not the best choice when the point of all this is to GO GREEN!! The Simple Ecology brand has the advantage over the other brands of offering different assortments of sizes. This brand is also committed to sustainability as they use certified organic cotton mesh that is GOTS certified. The downsides are that they only offer mesh bags and so again, not suitable for grains or other bin foods and also, the tare weight is listed very small and it’s hard to read quickly for the cashier checking you out. Also, there is no toggle to hold the drawstring closed. Customers seem to say that the bags stay closed well enough but if you are looking for a bag set that has a secure toggle, this is not the set for you. Overall, this looks like a good company with good intentions and a nice product. 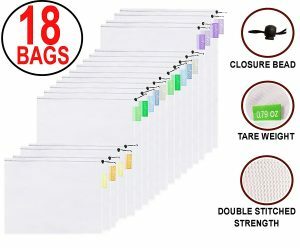 If simple, mesh drawsting bags is what you want, this would be a good choice. 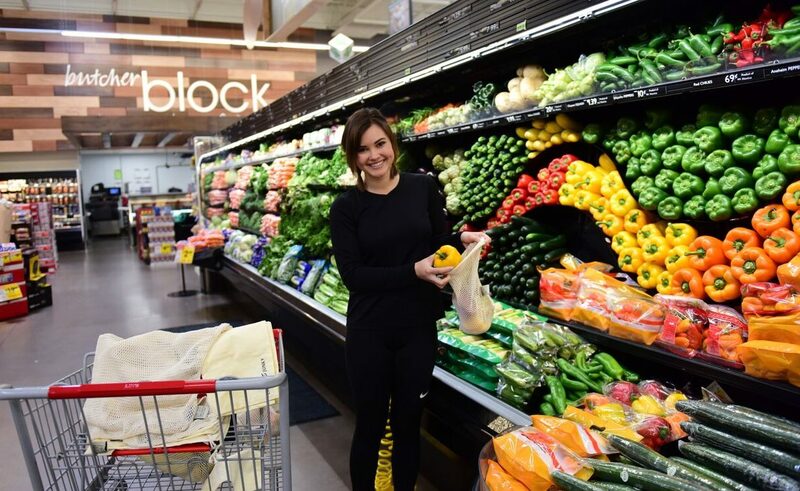 To wrap up, I think we can all agree that if you are bringing your own bags to the grocery store you are a step ahead of the game and you are doing your part and even in this small way, you are helping to make a difference! Let us know which reusable produce bags you like the best! We would love to hear your feedback!